1824 Ashaway Line & Twine Mfg. 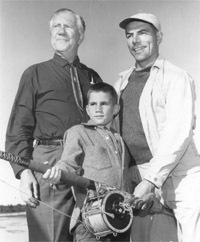 Co., was founded by Captain Lester Crandall who manufactured fishing line. He devised and perfected several line-making machines. 1939 Ashaway produced the first commercial nylon product in the world - fishing line - when a then young company, DuPont, was looking for a use for its new filament. 1949 Ashaway began making racket strings in its Rhode Island plants. 1952 The year Dacron® was introduced, Ashaway used it in a fishing line. 1977 The company introduced the first Kevlar® tennis string to the market. 1999 Ashaway celebrated 175 years of manufacturing in Rhode Island and 50 years of producing world-class racket strings. 2009 Ashaway introduces new ZyMax® badminton strings manufactured with Ashaway's revolutionary ZyWeave TM core technology. ZyMax 62 is the thinnest badminton string ever produced. 2011 Ashaway introduces the world's first 19-gauge squash string - PowerNick® 19. Dacron and Kevlar® are registered trademarks of E.I. DuPont de Nemours and Co.